For over a year now we have been out of date with the having seen a game at All the Current Ballparks claim, but we now have tickets to see the July 1, 2011 game at Target Field. 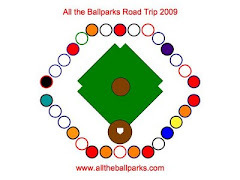 Our summer travels are not as extensive as 2009 and definitely not baseball focused (quite Disney focused instead! ), but we are going to take in a Twins game and also going to fit in seeing the oldest ballpark (Rickwood Field in Birmingham, AL). Perhaps a few more Tucson Padres games as well during the parts of the summer we are home.